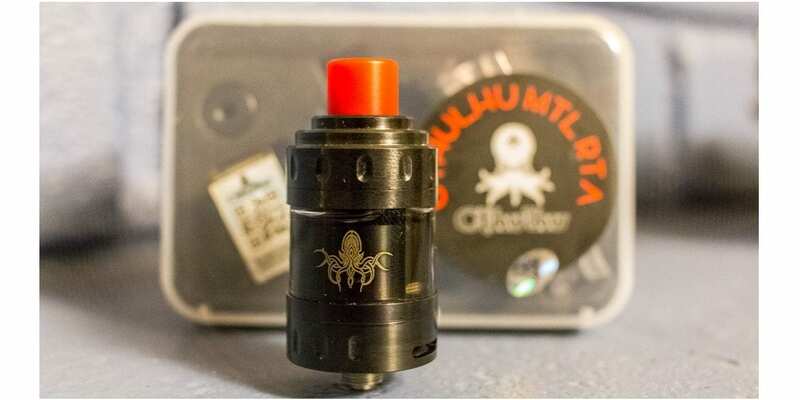 Cthulhu MTL RTA Review - Daily Vaping Deals & The Best Vape Product Reviews at Vaping Cheap! Based in Shenzhen, China, Cthulhu Mod have been releasing some quality atomizers for quite some time now. From the Hastur series to the Shuriken and then to the Gaia, Cthulhu Mod have been gaining attention and popularity amongst avid vapers. Introducing the Cthulhu MTL RTA, a 24mm mouth to lung / restricted lung hit atomizer that really pushes the boundaries on what we have seen before in this market. We are going to take a look at this revolutionary atomizer, see how it performs, weigh up the pros and cons and then I’ll tell you if it’s something I’m going recommend. 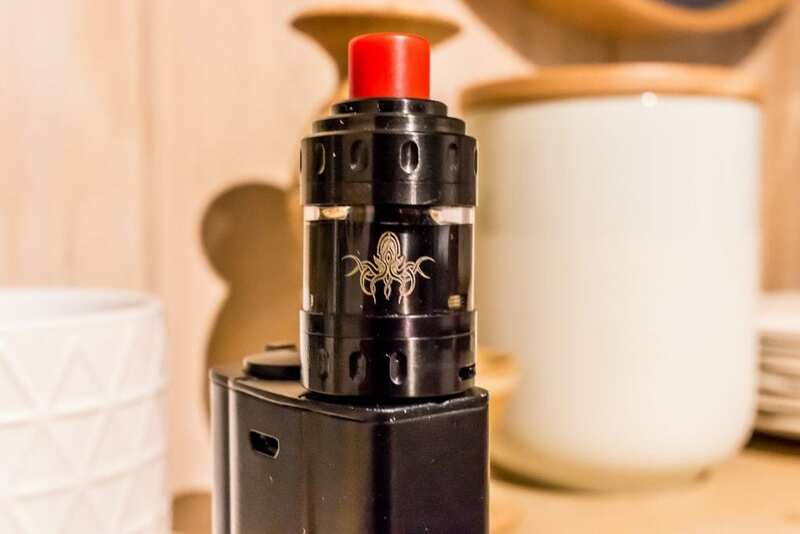 A big thanks to GearBest for sending the Cthulhu MTL RTA my way for the purposes of this article. Check out the Cthulhu MTL RTA Here! Click Here to Check out the Cthulhu MTL RTA! I really love the attention Cthulhu Mod pays to the packing of their atomizers, coming in either a compact plastic box or fancy gift wrapped looking boxes. The MTL RTA came in a plastic box, with a foam insert. The box is resealable via a clasp and made from soft, clear plastic. The atomizer information is displayed through the back of the box and you can see the tank through the front of the box. There is a Cthulhu logo sticker on the front along with an authenticity scratch sticker. I have to say, the whole package looks really cool and timeless in way they have presented it. Due to being packaged so well, there is no worries with the tank being damaged in transit. I received the black version of the tank, however it is also available in silver and gold finishes. The drip tips are red, which is the wider of the two and the other one is black. The tank is definitely visually appealing in it’s design and is somewhat intriguing to look at. There is knurled inserts on the sections above and below the tank. The chamber section sports the Cthulhu logo, which looks great. The design is nice and compact, with the three tiered top capping it off just nicely. There are two cyclops shaped airflow holes on opposite ends of the base and the adjustable airflow looks to be very smooth to operate. 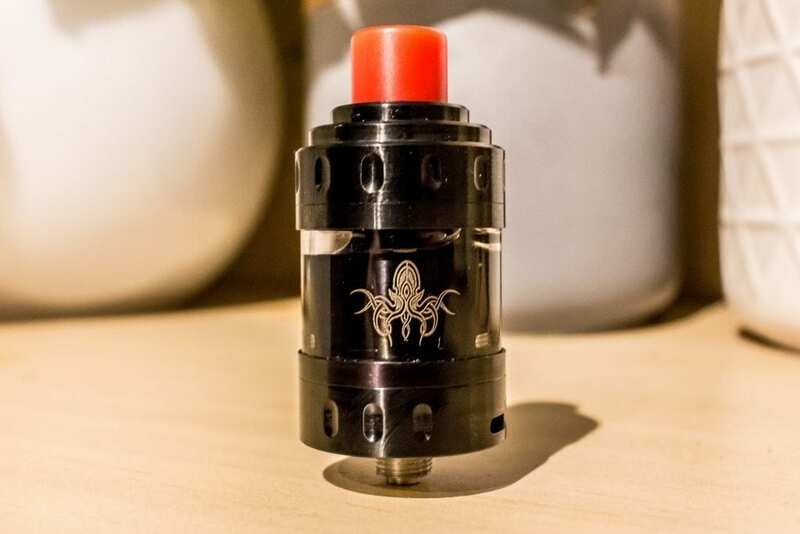 The accessories included with the Cthulhu MTL RTA are a spare glass section, three air flow resisters, two different inner diameter drip tips, a screwdriver and a spares pack which includes two spare screws and some o-rings. Taking the tank out of it’s box, it feels really solid and well made. The build quality and machining is top notch. There was no smell of machine oil, however I still gave it a quick bath before using it. Everything fits together nicely with the correct tolerances on the o-rings. I do have to say the threads on the base are a little sharp, I didn’t cut my finger per say, but I could tell that I may have if I had used a little more force. The Cthulhu MTL RTA breaks down into five parts for cleaning, building and general maintenance. It comes apart easily and is easy to put back together. The 510 pin is not adjustable, however when you loosen it off – the deck comes out. This makes me think that Cthulhu Mod have future-proofed this design to possibly accommodate different decks or for compatibility with other atomizers in their range. Who knows at this point? Installing coils on the deck is a breeze, as they deck is fully exposed when broken down. It is designed for single coils, being a two post system, as most MTL tanks are. Ensure you have your coil with the ends facing away from each other and unscrew the post screws. I found it’s a little easier to remove one screw fully as you can tuck one end under the first post and then line up your coil and the other end without having to tuck both ends under. It’s important to make sure you trim the excess overhang from your coils as close as possible to the posts, as there is a tight tolerance when you screw the chamber back on and it will short out easily. Wicking is dead easy as well. I found that after threading the wick through the coil, it’s best to make an upside down u shape with the wick and trim it to where it touches the base of the deck. You then simply pick each end up with some tweezers and place it into the wicking ports. Not too tight and remember to fluff out your wicking material for best results. It should sit in the wicking ports without being stuffed in there too much. To fill the Cthulhu MTL RTA, you screw off the top cap which exposes the large fill holes. This tank will hold 3mls of liquid, which is ample for a MTL style tank. I closed off the airflow and juice flow while filling to ensure that there was no leaking. This doesn’t always work though. I found that sometimes when filling the tank you can get some gurgling and possibly a little juice in your mouth if your not careful. 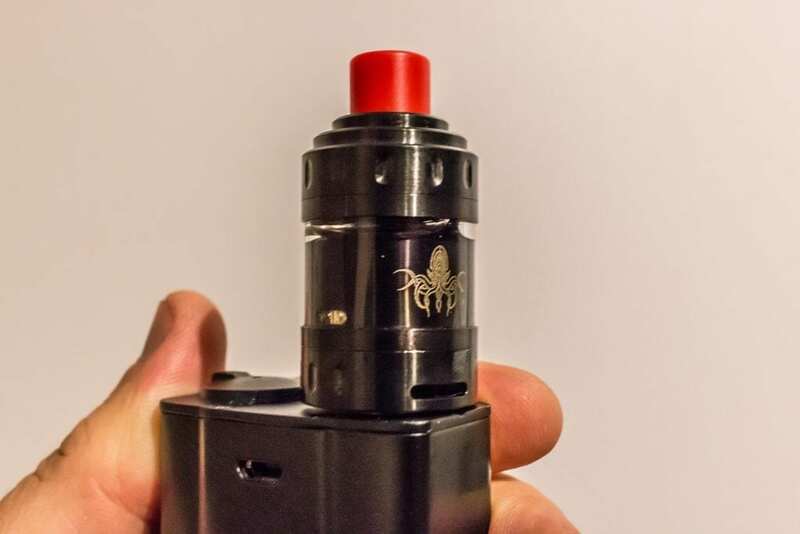 This can be resolved by giving it a flick or a shake whilst facing the drip tip downward, which forces the excess juice out through the chimney. Before you install your coil, you need to choose which size airflow restricter you wish to use. The airflow restricters are designed to give you resistance in your draw, something that MTL enthusiasts love – as it can mimic the draw you get from a cigarette. The resisters are screwed into the air intake directly under the coil with a flat head screwdriver and they come in 1.2mm, 1.6mm and 3mm sizes. If you choose to leave out the restricter, the default size is 4mm – which is plenty enough for a restricted lung hit. The airflow is adjustable and very simple to operate by rotating the very bottom of the tank. There is minimal resistance when turning it and the settings are mirrored the same on each side. The airflow locks into place at each end and can be set freely wherever you like, as there are no locking locators. The juice flow is also adjustable and can be set by gripping the glass and turning. There is a fair amount of play in the adjustment from fully closed to all the way open. It does take some time to get the balance on how to adjust either the airflow or the juice flow, but it is definitely not hard to do. The first build I installed in the Cthulhu MTL RTA was a spaced, twisted 28 gauge kanthal coil – which came in just on 1 ohm. I wicked this with cotton and left out the airflow restricters to begin with. Vaping between 20 – 25 watts with the airflow set to about half and juice control wide open. I was impressed with the flavor and even the vapor production for a MTL tank. It was a really satisfying restricted lung hit, with enough flavor and vapor to keep me coming back to it. I think the short chimney that steps up towards the mouthpiece, really aids in the concentration of flavor and seems to promote vapor production somewhat. From there I played around with the different airflow restricters and coils. I tried regular micro coils, spaced single coils and even a stainless parallel build. Although it’s not really a necessity for MTL tanks, I can say that the Cthulhu MTL RTA worked well in TC mode and also with all of the other coil builds I threw at it. The maximum ohms I went up to was around 1.8 and by this stage I was up to the smallest airflow restricter. By this point I was purely taking mouth to lung draws like I would have done on a traditional cigarette. I was down at around 9 – 12 watts and I was still satisfied with the flavor I was getting. With the smallest restricter and the airflow shut most of the way, I was able to replicate the draw of a cigarette quite well, I wouldn’t say spot on, however it was getting close. I have to say that I was also using the smallest diameter drip tip here, which also aided in tightening up the draw quite drastically. The juice control works well for different viscosity of e-liquids. You can close it of for primarily higher PG ratios or thinner juices and open it up for denser, higher VG ratios. As I mentioned previously if I was not careful cutting off the excess coil from the post clamps, I would find that the tank would short out from time to time. Not constantly, but enough for me to have to pull the tank apart and rectify the issue. Once it was trimmed accordingly, the shorting stopped and everything was going as it should again. Due to the design of the tank, you can leave your juice in the reservoir while inspecting your build, but you have to ensure that it stays upside down while doing so. This is a huge pro for me, personally! There was no ohm jumping that I noticed while using the Cthulhu MTL RTA and I found that it read the same on a variety of mods that I tested it on. It looks great on most of my devices, although it can create a slight gap on some of them, which some people can find a subjective con. For me, this doesn’t phase me much as I’m more concerned about how an atty performs than a slight gap. Something simple that can be forgiven very easily. All in all I found the Cthulhu MTL RTA to be a solid performer. Once you couple the adjustable airflow resisters, the adjustable airflow, the juice control and the different diameter drip tips – you can really get to a very very customizable and unique tank setup to cater for your individual preference. I am impressed that Cthulhu Mod have included so much, to make this tank as customizable as possible, with out the need to purchase additional add-ons for it. Everything is right there in the box and included in the initial purchase, which I see as great value for money. So considering this mod can be tailored to your individual vaping style, and that it performs the way it does all across the range, I have no hesitation in recommending this product if it seems like something you would be interested in trying. For you MTL enthusiasts and you restricted lung hitters alike, give this tank a go. It may take some trial and error to get it setup just the way you like it, but once you do I’m sure you will be more than happy you did. You may just find a balance here that no other tank can quite offer. I hope this article has helped you on your quest to find your next new atomizer. If you have any questions or comments, please leave them below, we always love hearing from our dedicated readers. Excellent review. Every possible question a consumer might ask was answered. Thank you very much. Bought two of these and both had severe ohm jump issues.. what a waste of money.